Since I've downloaded a lot of songs for Christmastime, I thought I'd give back to this community by editing songs that are missing parts (mainly vocals since I use my Rock Band like a Karaoke). Since this is one of the few times I've charted everything by ear, let me know if anything can be improved. I'm also trying to figure out why the Venue camera seems to be stuck zoomed out on the crowd, so if anyone can help fix that, that would be great. Midi guide for vocals by MusicIsLife384 at MuseScore. Unfortunately, I couldn't chart the full barbershop quartet as there's only 3 Harmonies in Rock Band 3, but I did as much of the song as I could. Since Rock Band has limited space for keys, I kept the Right Hand parts and moved the early left hand portions to Bass. To prevent shifting back and forth for single notes, I changed some of them for the Pro Keys Expert, which makes the Hard and 5-lane Keys more "accurate" in terms of quick changes (since I removed chords on Hard). The na na's at the end are moved to the harmonies since Paul (the lead) is shouting stuff in between them. Those shouts are charted by ear since I can't find anyplace that has them written as lyrics, so they may have some errors. Also fixed a bit of desync of the tempo map at the end. Drums, Guitar, Bass, Pro Keys and Vocals based off MIDI from FreeMIDI.org. Reductions done by myself. Also some of the Pro Keys spanned more keys than Rock Band supports, so I had to make some edits to those notes. v2 - Edits to Vocals/Harmonies. v1 - Initial release with singletrack. This is the extended theme since the original one would be too short (though the Aku talking at the beginning would be funny). There seems to be 3 guitars in this song, but since one has very few parts, I merged it with the lead guitar and put bass on the rhythm guitar. Vocal edits, harmonies, and dry vocals by me. As far as I can tell, the 2nd Harmony seems to follow the 1st, but at a higher octave. At the end, a 3rd harmony joins for the longer sustained notes (you can still hear the 1st and 2nd harmonies going), but since that's only at the end, I merged the 3rd into the 2nd. At 0:33:00, there is conflicting accounts on different websites of the lyrics being "And Sing!" or "Dancé/Danser" (French for "to dance"). Since the audio sounds more like it starts with a D, I went with Dancé so it's easier to read. As a result, I had to export the midi as UTF-8 to support the accented e or else Rock Band would show it as an underscore (Danc_). Also I'm debating on whether or not to make the last few phrases into talkies, as they are hard to hit the right notes. Another nostalgic song I couldn't bear to leave unfinished . I found there's also an extended, remastered version, but I'm unsure whether or not I want to keep working on this. v1 - Added Pitched Vocals, Overdrives to Keys, Bass, and Vocals. Trimmed keys a little bit to fit band overdrive sync. GLaDOS - "Want You Gone"
Original Charts by Team Cena. Recharted by Jusey1 and m1999. Vocal MIDI by Sebastian Wolff. Edits to Vocal track, Harmonies, and Dry Vocals done by me. Youtube comments indicated some issues with the Drums parts, but I'm not too sure how well I can fix those since I don't play drums. Should be fixed now! v4 - Fixed drums to match Team Cena chart. Small vocal pitch edit. Reductions and Dry Vocals by me. v4 - Edited Pro Keys track to match Vocal Pitch. Also tweaked timing on notes on Keys track. v3 - Added Pitched Vocals to custom. Guitar parts done by TheBrownOneJT. Original Vocal MIDI by gbrademeyer from MuseScore here. Reductions and edits to vocal midi done by myself, as well as dry vocal track. Edited by InevitablEnd, October 9, 2018 - 04:56 PM. Also, just curious, but are we able to post songs that are in Rock Band 4/DLC? Like adding Keys to Semisonic's Closing Time, for example. Or is that something more for the Harmonies Project as an addon? Nnnnnnnnnnnnnnnnope, Closing Time was available before RB4 anyway! .... Closing Time was available before RB4 anyway! You sure? According to the C3 database, the wiki, and the Microsoft Store, Closing Time was made available as DLC for Rock Band 4 on October 17-18th, 2016 as Rock Band 4 had been released on October 6, 2015. If you don't bother to read the rules you're not gonna have a future in any forum on the Internet. I was going to say he would fit right in, seeing as how almost nobody ever does! I am aware of the rule of not posting full, licensed songs, I meant edits/addons to those songs, like in my example of adding the Keys track to a RB4 song, as RB4 does not have keys (like how the Harmonies Project adds Harmonies and Keys to older songs/DLC). Though now that I think about it, you wouldn't be able to play it then (unless something in the future adds support I suppose). "Want You Gone" has been updated to version 4. I went through the Team Cena video of "Want You Gone" frame by frame to update the drum charts, as there were some issues and complaints with Jusey1's original rechart. It should now be an exact sync of the track, but whether or not it's playable is another question, as I can't play drums very well to test it. Edits to tails4eva's DuckTales Theme and Safety Dance are done. Links are in his thread. Hi InevitablEnd, thanks for the conversions, i do some WIP customs, about UTF-8 midis,how put special characters like = `´ ~ ^¨ in reaper template, works on compilation? I try to convert or chart some Brazilian songs i need to do this on vocals. thanks for your hard work put vocals on customs. i can share some Reaper projects of mine, if you interessed, can you put vocals tracks on my first custom, is french, called je t'aime moi non plus? 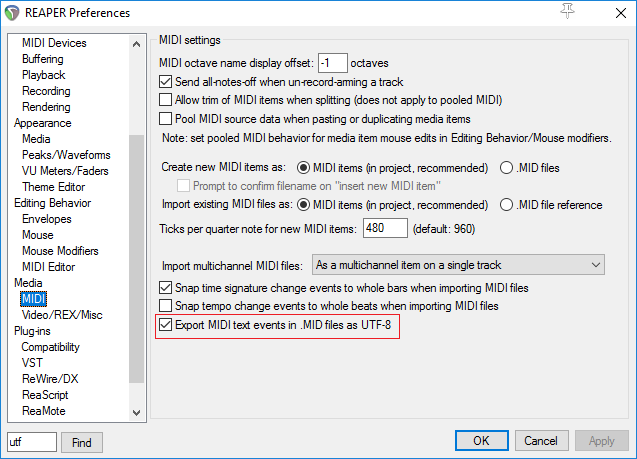 To export in UTF-8, open Reaper and go to Options -> Preferences -> Media -> MIDI and it should be the last option. I've been mostly doing songs that I enjoy (so I can bear hearing it over and over), know, and are semi-popular so I can find a midi easier for syncing. Since I don't understand French, I'm not sure how much help I can be, though for that song in particular, it looks like it's mostly talking, right? If I remember right, French also has a lot of silent characters, so even if I find the lyrics, I may not be able to sync it correctly since I won't be able to understand what I'm doing . Maybe I can try to see what I can do, but I can't promise anything, sorry. Thanks InevitableEnd, i will try your tip/tutorial with some brazilian midis, my uncle says to me to do some portuguese songs, i will try this in my future projects, thanks a lot you helped me. Edit to tails4eva's Behind These Hazel Eyes done, posted to his thread. To celebrate the upcoming new episodes of both Bill Nye the Science Guy and Samurai Jack, I thought I'd chart the theme songs to the original shows for fun. I'm on one of my getting-too-occasional shopping sprees of fresh customs. Thank you for "Safety Dance" and "Want You Gone"! Added Hey Jude by The Beatles using the Drums chart by Oscarj08/Sideshow.